The twentieth century was a golden age of mapmaking, an era of cartographic boom. Maps proliferated and permeated almost every aspect of daily life, not only chronicling geography and history but also charting and conveying myriad political and social agendas. 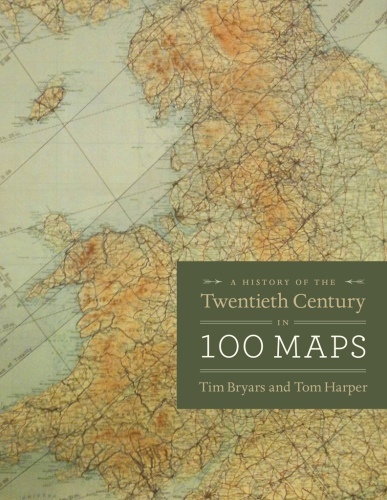 Here Tim Bryars and Tom Harper select one hundred maps from the millions printed, drawn, or otherwise constructed during the twentieth century and recount through them a narrative of the century’s key events and developments. As Bryars and Harper reveal, maps make ideal narrators, and the maps in this book tell the story of the 1900s—which saw two world wars, the Great Depression, the Swinging Sixties, the Cold War, feminism, leisure, and the Internet. Several of the maps have already gained recognition for their historical significance—for example, Harry Beck’s iconic London Underground map—but the majority of maps on these pages have rarely, if ever, been seen in print since they first appeared. There are maps that were printed on handkerchiefs and on the endpapers of books; maps that were used in advertising or propaganda; maps that were strictly official and those that were entirely commercial; maps that were printed by the thousand, and highly specialist maps issued in editions of just a few dozen; maps that were envisaged as permanent keepsakes of major events, and maps that were relevant for a matter of hours or days. As much a pleasure to view as it is to read, A History of the Twentieth Century in 100 Maps celebrates the visual variety of twentieth century maps and the hilarious, shocking, or poignant narratives of the individuals and institutions caught up in their production and use.